Amma visited New Mexico from 26-30 June 2006. 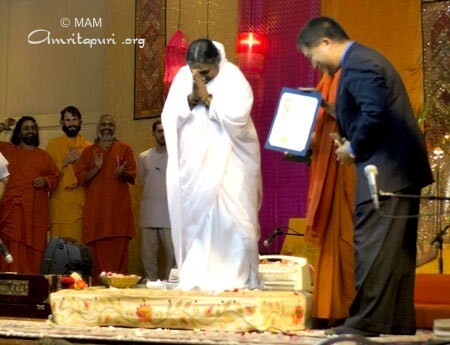 Amma was only in Los Angeles for five days—20 June – 24 June—but her face blessed the city for much longer. Giant posters bearing Amma’s divine image, announcing Amma’s visit, lined the streets of the City of Angels for almost two weeks prior to her arrival. 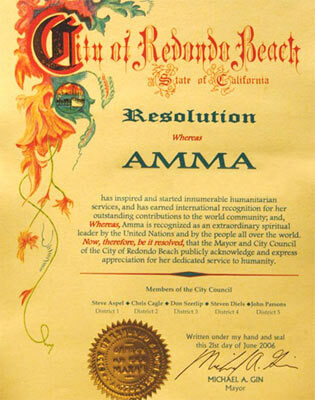 It’s hard to believe any of L.A.’s residents were not aware of Amma’s visit. As a result, the crowds were quite large. 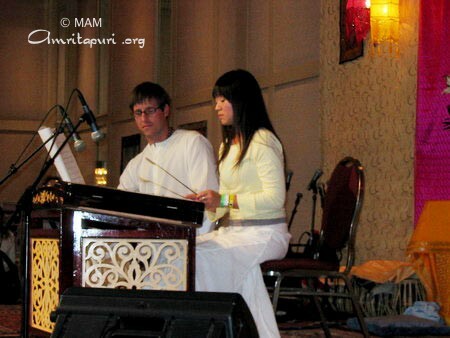 And Devi Bhava went on until 11:30 a.m. on the 25th. 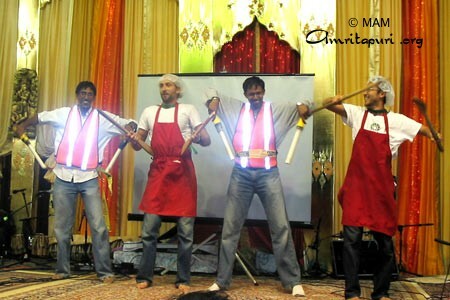 As has become tradition, on the second night of the retreat, the L.A. devotees, some of who are professional actors, put on very funny play. 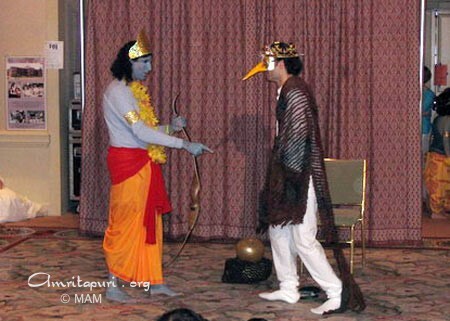 This year’s drama was a modernization of the story in the Yoga Vasistha of Garuda, the eagle who serves as the mount of Lord Vishnu, and Kakabhashundi, a wise old crow. It was almost 2 a.m. when the play and darshan finished. 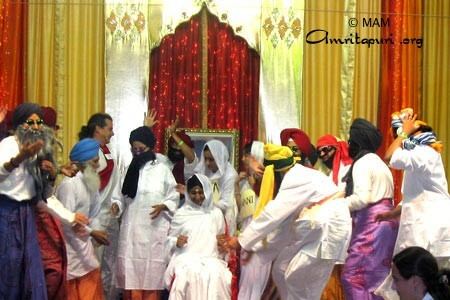 The devotees were asking Amma to dance. She agreed on one condition: that they would not just stand there and stare but that they would dance as well. And that is exactly what happened. 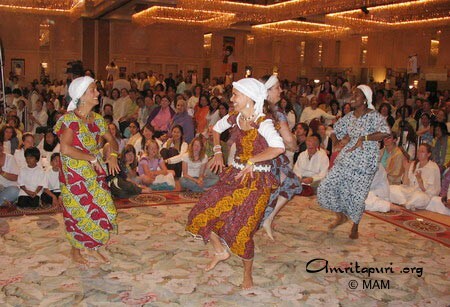 As Amma swayed side to side and chimed her kai-manis, the whole room jumped up and down to the rhythm. Amma was up on the bhava-darshan stage, so every one could see her. There were times when it became obvious that both of Amma’s feet were leaving the ground in her tiny dancing leaps. Each time this inspired a great cheer from the devotees. 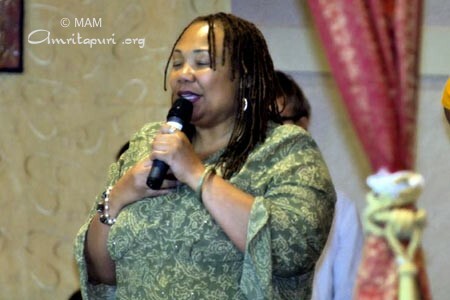 Ms. Yolanda King, daughter of the late Dr. Martin Luther King Jr., came for Amma’s blessing in Los Angeles. Just before arati, Ms. King garlanded Amma and, with a voice full of emotion, shared her appreciation of Amma with the 3,000 or so people who had come to have Amma’s darshan. The ballroom at the Los Angeles Airport Hilton filled with applause. Dr. Martin Luther King Jr. played a leading role in America’s civil-rights movement of the 1960s. Through his philosophy of non-violent protest, Dr. King helped attain equal rights for African Americans in the United States. Yolanda King is a member of the Board of Directors for the Martin Luther King Jr. Center for Non-Violent Social Change. Ms. King participated in Amritvarsham50, Amma’s 50th birthday celebrations, in Cochin. The sun is rising in San Ramon, illuminating the rolling golden hills of Amma’s ashram. The swans in the lake stir from their slumber and begin gliding around the still waters of the ashram pond. The chill desert air slowly warms. The sounds of horses snickering at one another can be heard in the distance. But while outside day is just waking, in the temple it never ended. Amma has been giving bhava darshan all through the night, and at 6:00 a.m. it is clear it will be at least another five hours until she has held the last person in her motherly embrace. n the mid-1960s, San Francisco’s Bay Area gave birth to the flower-power movement of the hippies—the reaction of America’s youth to the country’s growing materialistic and imperialism mentality. Forty-five years later, it remains home to the movement’s latter-day generation. And they love Amma. When Amma holds Bhava Darshan, they flock to San Ramon and dance in ecstasy as Amma’s swamis and devotees play an endless flow of bhajans. They typically dance on the temple’s balcony—wrapped in swaths of clothing, dreadlocks whipping through the air, babies strapped to their bellies. 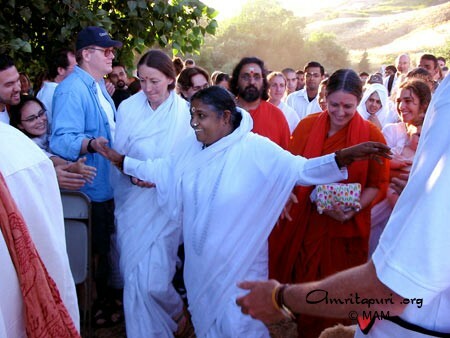 Once, a few years back, on a particular crowded bhava-darshan night, one of the local organizers asked some of the people dancing on the balcony to stop, as it was becoming more and more difficult for people to walk through that area of the temple… Somehow word of it came to Amma. “Who told my children not to dance?” Amma demanded to know. 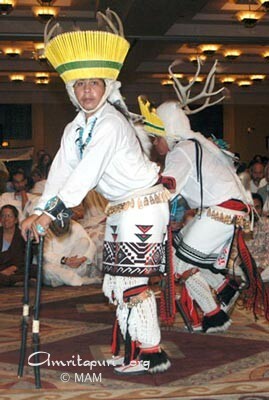 Amma is everyone’s mother, and the dancing of these descendents of the hippie generation are no exception. In their hearts they hold firm the ideals of peace, love and compassion. And through her nightly satsang, Amma is also educating them about the nature of the world, themselves and the universe, as well as the relationship between all three. She’s gonna show ya what it’s all about! 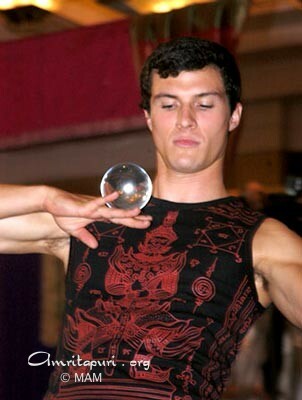 to make you do like a heck a lot of seva—baby! Amma’s got the smile to make the young kids go wild. To make your whole life be complete. 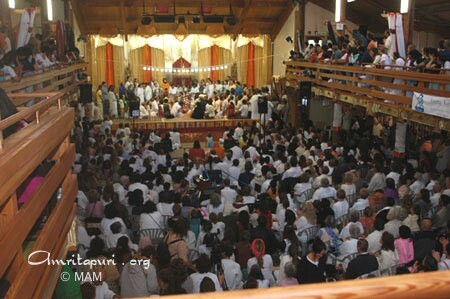 The first evening Amma was giving darshan at the MA Center in San Ramon, California, she did not give a live talk. Surrendering to the requests of her devotees, Amma allowed a video of her delivering the speech she had recently delivered at the Interfaith Center of New York to be played instead. For the next 20 minutes, everyone watched and listened to Amma speak—on screen—about “Understanding & Collaboration Between Religions.” Looking out at the thousand or so people seated in the hall, it was clear that long-term devotees and newcomers alike were deeply moved by Amma’s words. Amma of course could not help but smile at her children’s expression of their appreciation for what Amma had said in her address. “I thought the speech was dynamic, courageous and very much needed. And I hope that it is going to be a groundbreaker in terms of bringing those groups together that were in New York that night to do some work together—in the Middle East, in Malaysia, in Indonesia, in Darfur … wherever. As Mother said, I think that we do come together when there is a crisis, but we need to keep coming together when we are just living day-to-day life. “My prayer has been that human beings will not have to keep on learning from pain and suffering and loss and death, but that we can learn the way we learn here [around Amma] from having so much love around us, so much harmony and peace, that this would be our new way of absorbing. What Mother has shown us with her hugs and kisses is what I study in the Kabala [Jewish mysticism]; they say you can’t learn it from the books, you have to take it in the way you take in your mother’s milk, and that’s what Mother has given us, an opportunity to learn by direct contact” Novick concluded. 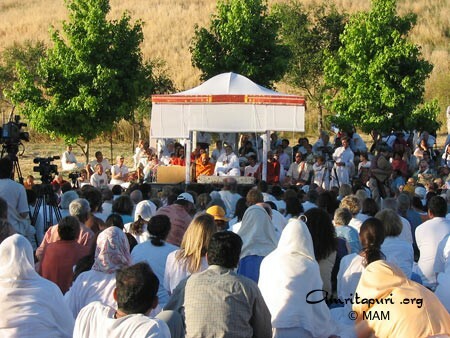 Amma visited her ashram in the hills of San Ramon during her 2006 USa yatra. Programs where held from 8-18 June. When Amma’s plane touched down at SeaTac Airport in Seattle on May 31st, it marked the 20th year that Amma has come to the United States. As Swami Amritaswarupananda pointed out in one of his morning talks during Amma’s “Northwest Retreat,” a lot has changed in the past 20 years, but on a deeper level things have remained very much the same. On the first night of Amma’s ”Northwest Retreat,” a seven-year old girl named Amritavarshini from Eugene, Oregon came for Amma’s darshan. As the child approached Amma, she gently placed a garland around Amma’s neck. The garland was not made of flowers, but of dollars—$200 to be exact, everything the girl had in her savings. As Amma held her, the child began to cry. She then gave Amma a letter she had written earlier that week with the help of her mother. How can we cure sick people around the world? How can the world see that we are ONE in harmony and stop bombing each other? How do we make slavery and racism go away? It really puts me in deep sorrows. Please give this money to the world that is sick. Please take care of all the sick and the poor. Amma told the child and her mother to sit by her side. ”Why are you crying?” Amma asked. ”What do you want to do for the world?” Amma asked her. The girl’s mother explained that about a week before she had come home to find her Amritavarshini in tears. When she asked her why she was crying, she replied that it was because of the slavery, wars, disease and poverty in the world. The girl then told her mother that she wanted to give all the money in her savings account to Amma. 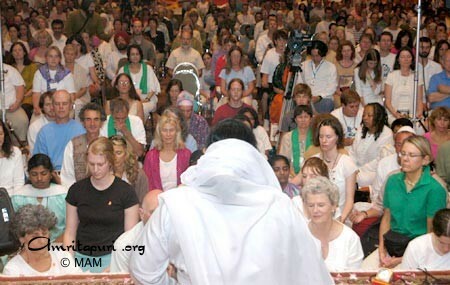 Amma has come to Seattle for the past 20 years, and for the past 13 years it has been the first city of her U.S. Tour. But this was the first year that Amma held a program in the heart of the city, just a stone’s throw from Seattle’s most famous building, the Space Needle, a 138-foot-high observation tower built for the 1962 World Fair. One of the great things about Seattle is that it truly is “a melting pot”—a country home to people of all cultures. This diversity clearly reflected in the collection of people who came to have Amma’s darshan. 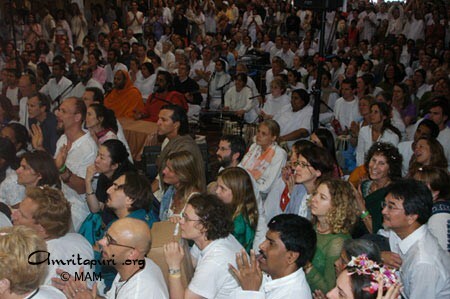 People of all colours sat in meditation, sang along with the bhajans and gazed at Amma as she gave darshan. 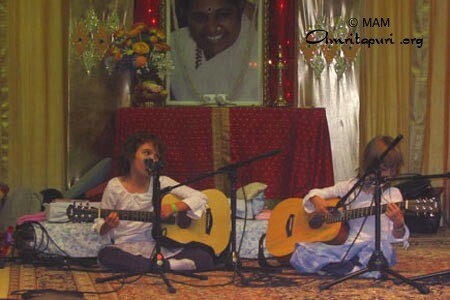 The first evening found both Amma and Swami Ramakrishnananda giving satsang. Swami Ramakrishnananda spoke about how, when he first came to the U.S. with Amma 20 years before, he had thought it was like heaven, because there was so much material prosperity. But then, as he listened to the people about their problems—drug addiction, teenage pregnancy, depression—he learned otherwise. “I soon realized that it was not a heaven after all,” he said. “Or if it was, it was heaven… with problems attached. I saw that there was a high standard of living, but a low standard of life.” Swamiji went on to explain how Amma has been helping people to overcome their problems through spiritual living. The next day marked the beginning of the “Northwest Retreat”—three intimate days with Amma on the verdant campus of Pacific Lutheran University in Tacoma. A time for satsang, meditation and bhajan classes, a question-and-answer session with Amma and a dinner where Amma herself hands each person their dinner as prasad. As usual, Amma’s 20th visit to Seattle ended with Devi Bhava darshan, which extended into the morning of June 5th. When it was finished, Amma walked out to a waiting car, shared one last silent moment with her children from the Northwest and headed on to her ashram in San Ramon, California. Amma will be there from June 6th to 18th.